This article describes how to set up a Publication Channel in Enterprise Server for publishing content to a Web site running on Drupal 7. Step 7. From the Publish System	list, choose Drupal 7 — Publish Forms. Step 8. (Optional, only when tags should be automatically suggested. See About adding tags to Web articles). From the Suggestion Provider list, choose the provider for suggesting tags. An additional property named 'Current Issue' appears below the Publication Channel Type property. Options for the Drupal account appear. 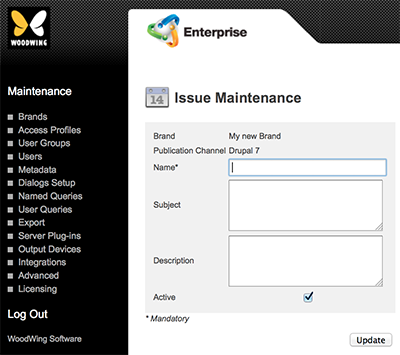 Below the Publication Channel properties area, a section for adding Issues appears. Web Site URL. The URL of your Drupal site. Note: Make sure that the URL ends with a forward slash "/". Consumer Key. The consumer key as set up on Drupal. Step 1. Access your Drupal Web site. Step 2. In the top menu bar, click People. Step 3. Click Edit for a user account that is used for publishing content. Step 4. Access the OAuth Consumers tab. Step 5. In the Operations column, click Edit for the displayed consumer. Step 6. Copy the displayed key. Consumer Secret. The consumer secret as generated on Drupal. Step 6. Click Show Secret. Step 7. Copy the displayed Secret. Certificate. (Optional, required for HTTPS (SSL) connections only.) The full file path of the local CA certificate file (in PEM format). See the SSL SDK for how to generate certificates. Step 12. Click Add Issue. Step 13. Fill out the details. Step 17. 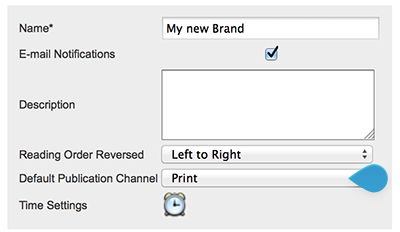 (Optional, only if multiple Publication Channels have been created) From the Default Publication Channel list at the top of the Brand Maintenance page, choose the default Publication Channel that should act as the default Drupal channel.